The term “seaweeds” here to refers to macroalgae – the kind you see clinging to rocks at low tide, or in beautiful subtidal gardens (these can also be found on beaches cast up after storms). They come mainly in green, brown and red varieties. The other plant group often called seaweeds are the seagrasses, which also occur in subtidal meadows, and are sometimes cast up onto the beach in huge swathes. These are good for mulch in the home garden, but generally lack the intensity of nutrients and other components found on the macroalgae. Extracts, however, are more beneficial to garden fertility. Having formerly been a research scientist in the field of Marine Plants, I experience a peculiar nostalgia in using the extracts of seaweed in my own garden. This is partly because I live in Normanville, South Australia, on glacial sand, a relict of the Permian glaciation of 260 million years ago. Although some plants thrive here, many others struggle, especially in the establishment phase, due to the low water holding capacity and low nutrient status of this soil. I have found some ways of using seaweed extracts in my garden beneficial, but have not tested these in scientific experiments.What follows draws heavily on an article by Craigie (2011). Macroalgae have been used since prehistoric times in gardening and agriculture to augment plant productivity, originally as a manure for the soil, or more recently as an extract applied directly to leaves and roots. Certain species are also useful as food supplements for animals and humans, and others as medicines. A very important class of extracts, known as the phycocolloids are known to most people as the viscous or gelling agents, alginate (from brown algae), and carrageenan and agar (from red algae). 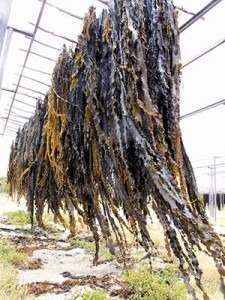 Since most seaweed processors are not the harvesters and are located at different sites, harvested seaweed is dried immediately, usually by hanging in the sun, otherwise it would go off very quickly. Transporting wet seaweed would cause problems with transportation costs and it would decay en route. In the garden, the use of liquid extracts has an advantage over applying seaweed directly as a mulch, because the composting cycle of about 15 weeks can be bypassed, generally by a process of hot alkali treatment which partially breaks down the phycocolloids. The extract is also rich in other soluble materials important for plant growth. I personally know of an orchardist in the Adelaide Hills who sprays seaweed extract monthly on his stone and other fruits. The application of seaweed extracts by spraying is usually in a very dilute form which would not contain enough mineral nutrients (nitrogen, magnesium etc) to explain the observed beneficial effects on the plants. It was assumed, therefore, that there were other components which stimulated the growth. Some of the most obvious candidates are the plant hormones, or cytokinins, which are known to occur in the extracts. However, more recent work has suggested that the larger molecules resulting from the partial degradation of the phycocolloids can be biologically potent as chelating agents which hold onto the mineral nutrients and make them available to the plants. Other components such as polyphenols and phlorotannins (which make the extracts brown) may also be active. While the possible effects of the cytokinins can’t be excluded, we should remember that they are rather unstable and do tend to break down over time in storage, especially if the containers are kept in a hot garden shed. Various commercial extracts are not necessarily equivalent, due to the different species used as a source and the differing methods of production. For instance, in Australia, Seasol is made from Australian Bull Kelp (Durvillaea potatorum), and some Knotted Kelp (Ascophyllum nodosum) sourced from the North Atlantic, while Seagold uses composted seagrasses and imported macroalgae. The claims made on the Seagold website about the value of the seagrasses in their product are almost certainly due mainly to the macroalgae which occur amongst the beach cast material they collect, or as epiphytes on the seagrass stems, as well as the imported ingredients. Another well-known brand from the northern hemisphere is Maxicrop, which uses A.nodosum, harvested sustainably from North Atlantic coasts. Despite these differences, the overall effects appear to be similar for general use. This is most useful as a treatment of potted plant material prior to planting out in the field or potting up to a larger container. Take a large container such as a bucket or old roasting tray and place your pots or tubes in it to be planted out. Then make up a diluted seaweed extract and pour into the container between the pots -about 1 in 100 would be the usual. Leave the pots sitting in the solution for at least 1-2 hours, or even overnight, depending on the size of the plant. The seaweed extract will enter the soil in the pots through the drainage holes, and then be absorbed by the roots, giving plants a head start from all the goodies in the extract. Small trees, such as citrus, can even be dug up from the garden where they have not thrived in the sandy soil and rejuvenated by this approach. I have soaked the root ball for several days before potting up. Of course, seaweed extract can be applied directly to soil around established plants. It will be washed in by rain or watering, eventually reaching the roots of plants, but in much more diluted form. I have not used this method, but it is reported to have beneficial effects on germination. These can be place in the planting hole or larger pot. Seasol have a product called “planting gel” with the appearance of dark brown jelly blobs. It is essentially polymer crystals which have been hydrated with seaweed extract, and can be used in potting soil to retain moisture, and act as a source of seaweed nutrients for the plants as they grow. I have also used these in planting holes, and have dug them in around plants which have been struggling in my sandy soils. They definitely help get plants going again, but the effect seems to wear off after a few months, I suspect partly because the gel has broken down chemically in the soil, or perhaps the roots have outgrown the limited source of moisture and nutrients. You can make your own seaweed gel by pouring diluted extract over a small amount of crystals. However, it is a bit tricky to do because you have to stir the mixture vigorously to prevent blobs of unhydrated crystals forming in the middle. Half a teaspoon of “crystals” to the cup of diluted extract is the recommended ratio. Some people are concerned that these crystals are environmentally unfriendly. I still use them, but I am moving more towards bentonite clay as a longer term means of retaining water and nutrients in the soil. At least it doesn’t degrade chemically, and the seaweed extract can be applied in other ways. 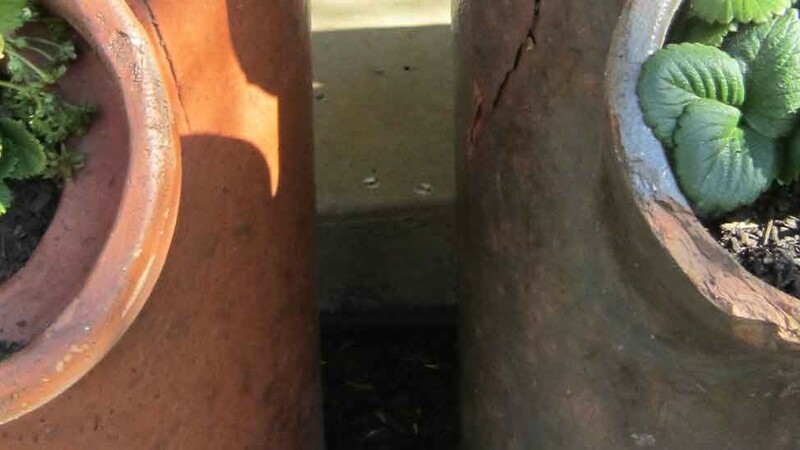 The extract is sprayed onto various plants at the recommended dilution and frequency. It can be used for vegetables, fruit trees, roses, lawns, potted plants or any other garden plant. The nutrients are absorbed through the leaves, so spraying should not be done before heavy rain. The important thing to remember is that the health of the whole plant, both below the ground and above, is important. Coming from a small acreage where I had a quandong orchard, I still own a couple of lovely big backpack sprayers which are still handy on a large suburban lot. Most people do not own such equipment, but there are quite a few smaller sprayers on the market or you can just simply use a watering can with a spray nozzle. Craigie, James S. (2011) Seaweed extract stimuli in plant science and agriculture. J. Appl. Phycol. 23:371-393.